Ali Carter crowned World Open champion after beating Joe Perry. 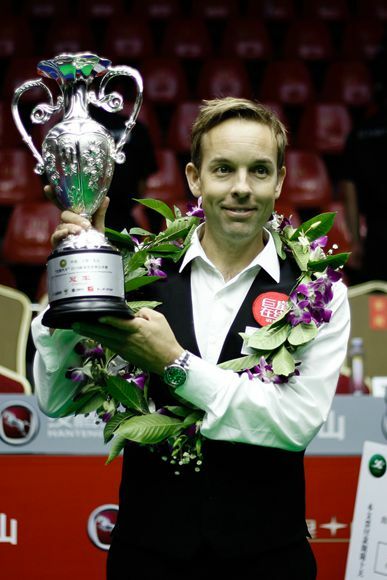 Ali Carter won the fourth ranking title of his career by beating Joe Perry 10-8 in the final of the Hanteng Autos World Open in Yushan, China. Carter won six consecutive frames to go 8-3 ahead, and despite an exciting late rally from his opponent, he secured the match in frame 18 to capture the £90,000 top prize. Victory sees the 37-year-old from Chelmsford jump 15 places in the world rankings to number 16. Carter's previous ranking titles came at the 2009 Welsh Open, 2010 Shanghai Masters and 2013 German Masters. Since then he has battled bravely against testicular cancer and a tumour on his lung, as well as the ongoing effects of Crohn's Disease. The popular cueman made an emotional return to the circuit late in 2014 and went on to win the Paul Hunter Classic – a minor ranking event – last year. Today's success is another just reward for his tenacity and determination throughout. This triumph, in his seventh career ranking final, also gives Carter a place in the Champion of Champions in Coventry in November and almost certainly the World Grand Prix and Players Championship later in the season. Perry was playing in his fourth ranking final and looking for his second title having landed his first at the Players Championship last year. The 41-year-old produced stunning snooker to beat Neil Robertson 6-2 in the semi-finals on Saturday, but only showed patches of that form today. His runner-up prize is £40,000 and he stays 11th in the world. Perry held leads of 2-1 and 3-2 early in the final, making breaks of 54, 56 and 78. But it was Carter who dominated the middle part of the match as he reeled off six frames on the spin. Runs of 80, 54, 91, 53, 61 and a superb 70 clearance in frame 11 helped the Essex potter surge 8-3 ahead. Cambridgeshire's Perry stopped the rot in a scrappy 12th then made an excellent 131 in the 13th to close to 8-5. Breaks of 37 and 31 helped Carter win the next, then Perry made a 106 to claw back to 9-6. Carter had a match winning chance in frame 16 but missed the last red with the rest when trailing by 11 points, allowing his opponent to clear up and reduce the deficit. And Perry continued to gather momentum in the next as a run of 92 saw him draw within one frame at 9-8. But two-time World Championship finalist Carter withstood the pressure and finished in style with a break of 127.